Iktishaf means “discovery.” Launched in October 2010, the Iktishaf Project is an ongoing collaborative initiative between students at NYU Abu Dhabi (NYUAD) and students Zayed University (ZU) in conjunction with the Abu Dhabi Film Festival (ADFF). Established in 2007, the ADFF has quickly become one of the most alluring juried competitions on the international film circuit. Meanwhile, the creation of the Abu Dhabi Film Commission (ADFC) in 2009 by the Authority for Culture and Heritage launched Abu Dhabi as a major player in global media production and post-production. This Iktishaf Project presents many opportunities for discovery. NYUAD is in its first year with a global student body, whereas ZU is an established university in the UAE with an almost entirely Emirati student body. The Fall 2010 collaboration with the ADFF offered first-year students at NYUAD who had recently arrived from Australia, Canada, Hungary, Qatar, and the United States an unprecedented opportunity to discover filmmaking and film festivals through creative projects with advanced students from ZU, most of whom call Abu Dhabi, or nearby cities in the UAE like Al Ain, home. Together, students from both universities discovered a side of Abu Dhabi that differed from the ones they know in classrooms, dormitories, and dining halls: they discovered an Abu Dhabi that is an increasingly vibrant site for 21st-century media. Students from my Language of the Moving Image course at NYUAD and Prof. Nazar Andary’s World Cinemas course at ZU worked together in small teams, collaborating on the development, production, and post-production of a series of seven short videos on subjects that presented a distinctly student perspective on everything related to the festival and filmmaking, including being young filmmakers and cinéphiles in Abu Dhabi. The students participated in three workshops — preproduction to brainstorm ideas; production to learn to operate cameras, microphones, and tripods; and postproduction to learn the basics on nonlinear editing — with the two professors and Dan Carbone, Instructor of the Arts, and even had the opportunity to solicit feedback from NYUAD’s Associate Dean of the Arts, Mo Ogrodnik, who conceived the partnership with the ADFF. The goal of the Iktishaf Project is to provide students with a direct learning experience that draws on their academic coursework on film styles and aesthetics and carries over into their lived experience. The project enables students to interact with professionals from different institutions within the film industry and to play a role in the development of Abu Dhabi as a key player in the industry, both regionally and globally. Students in the NYUAD class also participated in ADFF master classes with young filmmakers from Algeria, Belgium, Lebanon, the United States, and the UAE. Several of the interviews featured in the Iktishaf videos were shot after these master classes, which were held in the festival tent at the Emirates Palace Hotel. Students also conducted interviews after screenings of the Emirates and Shorts competitions. Students from Reel Deal Productions, the NYUAD student film organization, also attended the ADFC Education Day with me, where they were among 200 film students in Abu Dhabi to participate in a scriptwriting workshop, watch a demonstration of a small-crew film shoot (using a only slightly higher model of camera as the students in the Iktishaf Project used for their videos), and listen to representatives from local agencies present information on internships and funding opportunities, including a presentation on the SANAD Film Fund which awarded US$500,000 in support local filmmaking in the region this year. Education Day is part of the ADFC’s Circle Conference to promote Abu Dhabi as a site for world-class professional film and television production. Iktishaf means “discovery,” and discovery is only the beginning. Dale Hudson is a Faculty Fellow at NYU Abu Dhabi and a Digital Curator at the Finger Lake Environmental Film Festival. 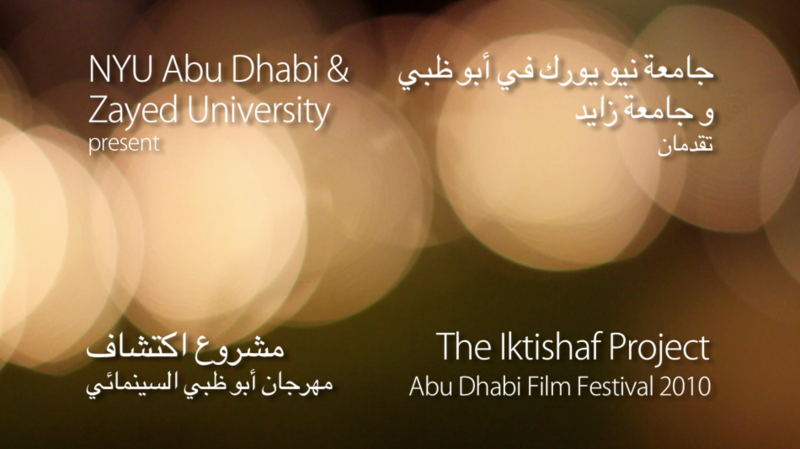 Click here to go to the official YouTube page for the Abu Dhabi Film Festival.